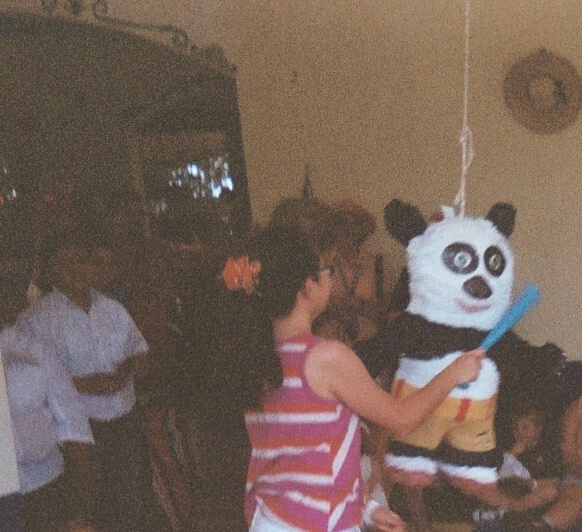 Home » Posts » Mid-Week Focus » Make a Bi-lingual Piñata to Celebrate/Celebre Cinco de Mayo! …it’s time for Mid-Week Focus to feature eye-catching, ear-catching ways to celebrate Cinco de Mayo, coming soon! Shake maracas to celebrate Cinco de Mayo. Have you noticed as I have that Cinco de Mayo has become an especially popular day for “going Mexican,” even for those with no direct ties to the country of Mexico? Restaurants that feature cuisine from south of the (US) border attract busy families with Cinco de Mayo specials. But, how many of us know what Cinco de Mayo actually celebrates? History, step forward, please! 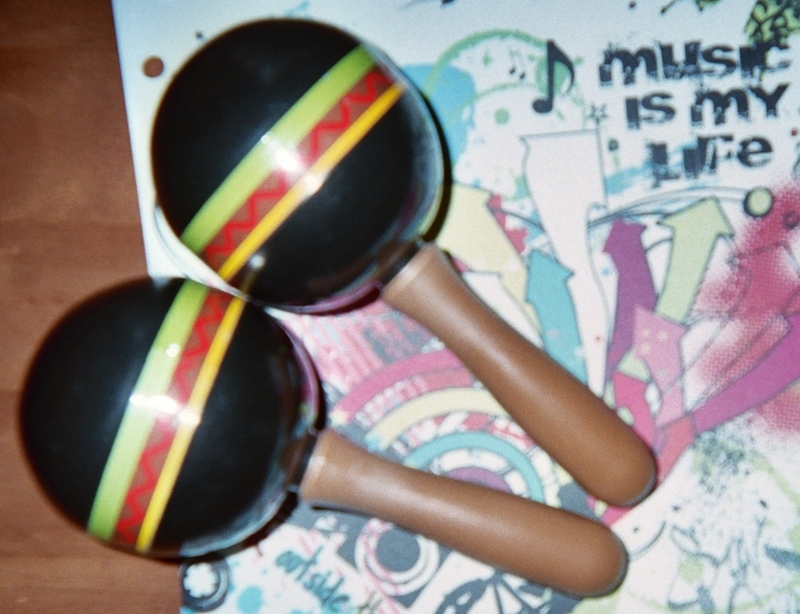 Personifying history by donning simple costumes, like a sombrero for Cinco de Mayo, and holding musical instruments of the featured locale and time, like the maracas in my blog pic above, is a creative and effective way to engage kids in learning about the past. Turning history into a walking, talking live figure (you, the teacher; a designated student; or a guest) makes the past relevant to the present for children. Cinco de Mayo is a day of celebration that honors Mexico’s victory over the French army in 1862. Mexico had gained independence from Spain in 1821, over fifty years before that special day in May. As a new nation, this colorful country that lies south of the US border needed help from other nations to maintain its independence. Mexico borrowed money from Spain, England and France to grow its economy (making, selling and buying goods and services with money). But, soon these countries wanted to be repaid. They decided to send armies to Veracruz, a city on the Gulf of Mexico, to invade the land of the orange, green and white flag. Just after the ships landed in the port there, England and Spain called their armies back home. Only the French went on to try to conquer (take control over) Mexico. On May 5, 1862 during the Battle of Puebla the Mexican fighters stopped the French army from taking over the capital, Mexico City. Ever since that day, Mexicans living everywhere have celebrated Cinco de Mayo. Cinco de Mayo in Mexico is a festival day with parades and floats covered in flowers. Fireworks light up the early May evening sky. Ask your class to help you make a Cinco de Mayo Poem Piñata, full of language arts fun! Whack, smack, when will the Cinco de Mayo poetry phrases and candy fall out? 1. To save time use a discount store-bought piñata, like you see in my blog pic here. 2. To make your own, use colored markers to decorate a large sturdy paper bag that will serve as the piñata. 3. Print the bi-lingual poem (below) that I’ve written for this Mexican holiday. Optional: re-type the poem with the two languages on two sheets of paper so that you can print two matching sides, one in English, one in Spanish. NOTE: This free verse poem has fourteen short phrases in English and Spanish with no capitalization. The intentional lack of capital letters allows students, with their teacher’s guidance, to sequence the phrases as they choose. Optional: Challenge students in grades 3 – 5 to listen attentively to the story of the origin of Cinco de Mayo (above) as you read it aloud. Explain that you want them to be well prepared to piece together a correctly sequential poem using the phrases that fall from the piñata when they “whack” it open. Focused listening at work! 4. Cut the poem phrases, line by line, to make “poem strips” to slip into the Poetry/Poesia Piñata. 5. Slip the phrase strips into the piñata. If you’re using a paper bag, fold the open ends of the bag over and tape them together, leaving a quarter-inch of the middle open. Mark the open spot. 6. Turn the bag upside down and staple a string to the middle of the bag’s bottom to hang the piñata up. 7. Invite students to gently “take a whack” (or pretend to) at piecing together a poem about Cinco de Mayo, like the girl in the blog pic above. 8. Pull the bag open from the middle to let the phrase strips (and candy if you’ve added candy) fall out. 9. Let students “play” with the phrases, sequencing them with tape on a large poster board, in a logical way, according to the history that you’ve introduced. Optional: Use this activity to reinforce the concept that poetry is formed with phrases, not sentences. Discuss each phrase. What pictures does it paint? What parts of grammar does it include? What power words does the phrase include? Cinco de Mayo is just around the corner, but kids love to celebrate any time of year! Teachers can bring history to life as part of the study of cultures worldwide. If you’re in a year-round school or summer program (northern hemisphere), consider planning festive ways to recognize other countries’ independence days that will be celebrated over the summer or in the coming 2013- 2014 school year. Link festivities to historic days coming this fall in the southern hemisphere. These activities help kids become smart global citizens. Check back at the end of the week for a new International Festival of Attention-Grabbers. Meanwhile, please send comments about your favorite independence day celebration.